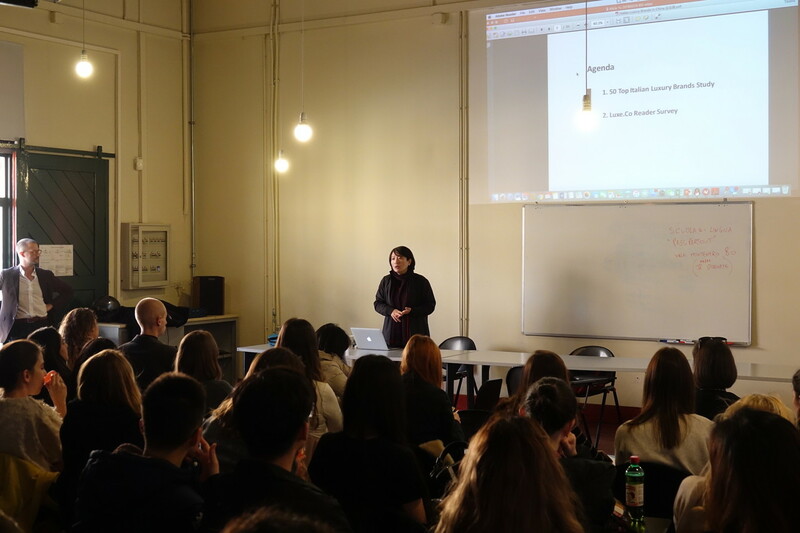 Invited by Istituto Europeo di Design (IED), President of Orange Bay University and Founder of Luxe.Co, Alicia Yu, delivered a talk on February 20, 2019 in Milan for IED MA students majoring in fashion marketing. Founded in 1966, IED is headquartered in Milan, Italy, with campuses in major cities in Italy and Spain. IED is the world’s first school teaching design with an interdisciplinary manner, focusing on linking academic education and practices. IED has trained a group of world-renowned design talents over the past 50 years, including Maria Grazia Chiuri (Creative Director of Dior), Pier Paolo Picciol (Creative Director of Valentino), Marco de Vincenzo (Accessory Designer of Fendi), and Bodin Hon (entrepreneur and winner of the James Dyson Award 2014). IED emphasizes on integrating academic education and professional practices into studies. Teachers are from professional fields, who are writers, designers, creative talents, photographers or technical experts from enterprises. This coincides with the idea of Orange Bay University, the innovative fashion business school. Students of Orange Bay University have usually achieved certain levels in their respective fields. To be prepared for a new level, they need to deepen their understanding of the fashion and lifestyle industries, broaden horizons and refresh visions. Based on a rich collection of global brand practice cases, Orange Bay University have invited outstanding entrepreneurs and investors to teach and analyze case studies, and share insights and their own practical experiences. The curriculum is rigorous but open, aiming to enhance students’ industrial understanding and practical ability effectively. Ms. Yu also shared her insights of the fashion industry. Based on the “Italian Luxury Brands in China” report released by Luxe.Co’s research team in Fall 2018, Ms. Yu reviewed the development and current status of 50 renowned Italian brands in China. She analyzed the strategic decisions of these brands in different stages in the China market, online and offline channel expansion, digital marketing, celebrity endorsement and Luxe.Co survey results. Detailed informative and data provided IED students a clear picture of the development of Italian brands in the China market. The report presented the enthusiasm of Chinese high-end consumers on Italian brands and luxury goods, which brought closer the distance between Italian students and the mysterious and exciting China market. Today, brand marketing needs to fully understand and respect social and cultural characteristics in the local market. Ms. Yu noted that many European luxury brands are strengthening their brand diversity and comprehensiveness. Senior managers with different cultural backgrounds have participated in the process of brand culture building. However, the proportion of Asians has yet to be strengthened. The understanding of Chinese consumers and Chinese culture also needs to be enhanced. In the second part of the lecture, Ms. Yu reviewed briefly the investment trends of the global fashion industry in the past year, and emphasized particularly on the importance of entrepreneurship and innovation to the industry development. Luxe.Co has been reporting and analyzing Chinese startups. With some of these companies as examples, Ms. Yu summarized the skill requirement for entrepreneurs in order to be favored by consumers and investors, in the competitive fashion and lifestyle industries. Ms. Yu was pleasantly surprised to find that many Italian students expressed strong interest in the topic. The entrepreneurial climate is relatively weak in European countries. Orange Bay University’s highly targeted fashion entrepreneurship program is a much-needed training for young people in relevant fields. Ms. Yu expressed that Orange Bay University would take its self-developed fashion entrepreneur program to overseas market in due course. This will allow many European fashion entrepreneurs, who are interested in creating their own brands or exploring the blooming China market, to obtain learning opportunities to elevate their entrepreneurship capabilities across the board, and to enhance the communication between Europe and China in fashion entrepreneurship and investment.